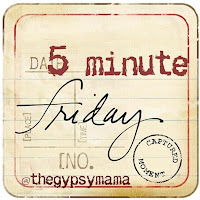 Joining with Five Minute Friday - the rules/participants are here. Closure. Reconciliation. Understanding. Justice. Fairness. Mercy. There's an ache in my heart for all of these things for a variety of circumstances, most out of my control. I must trust that I have done all that I can do, and then rest. And trust. Trust that He is big enough to handle all the questions and frustrations. In the morning I stretch and twist, trying to rid myself of all of the aches I physically experience already - (how is that possible? I am not old. ), and in similar fashion I find myself twisting and stretching, trying to rid myself of the aches and pains emotionally, mentally, spiritually. But the aches remind me there is always more work to do. Always something to pray about. Always some way to respond, even when it doesn't feel like a very tangible, immediate action. And so I let the aches serve their purpose. I loved your blog title and blue jeans pic. I had to come say hi, hopping over from the Gypsy mama.